On Saturday, September 21st over 90 Urban Initiatives boys and girls from three different Chicago communities came together for the Multicultural Cup at the Haas Park soccer field. 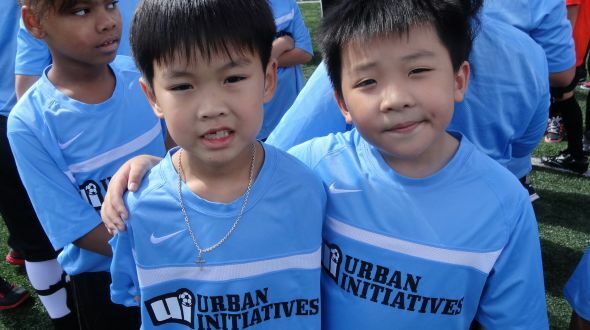 The Urban Initiatives Multicultural Cup uses soccer as a tool to introduce Work to Play program participants to the abundance of cultures that exist around the world. Morton School of Excellence from Garfield Park, Goethe Elementary from Logan Square and Ward Elementary from Amour Square Park all represented their communities and cultures at the Multicultural Cup this year. The day began with a much-needed donation from our friends at Starbucks. Hot coffee and nutritious bananas gave Urban Initiatives Junior Board members and our volunteers the much-needed fuel to get them ready for the arrival of boys and girls from all across Chicago. As the busses arrived, kids flew off one by one thinking they were only playing soccer but little did they know the Urban Initiatives program staff and volunteers set up four multicultural stations that gave them a glimpse of what life is like in countries thousands of miles away. Coach Jeff’s Language station taught kids how to speak Cape Verdean Creole while over at Coach Adam’s Martial Arts station they learned basic Isshinryu Karate. And promised to never use their new skills to harm their fellow teammates, schoolmates and community members. Coach Patty’s Mural station gave kids an opportunity to share pictures and symbols that represent their own culture. Coach Becca had the kids moving at her Yoga station. The kids left her station feeling energized and ready for some soccer. Rather than having kids from each school play against each other, Coach Brendan gave the kids a chance to make a few new friends by mixing up schools and having them play together. The sight of sweet spot passes, throw-ins and high-fives filled the soccer field at Haas Park while Urban Initiatives volunteer coaches cheered on and gave great direction to their players. The day wrapped up with our hungry soccer players trying some news foods for the very first time. Curry Fried Rice, Hummus, Pad Thai, and Pad See Ew were all served and kids enjoyed every bite as they learned what kind of healthy foods other cultures nourish their growing bodies with. Urban Initiatives would like to thank Joe Henry and his amazing staff at Haas Park for providing the perfect location where families from different parts of the city came together for a unique cultural experience. We also couldn’t start our day with so much energy without the generous donation and support from Starbucks. Thank you also to the Urban Initiatives Board and Junior Board Members for coming out and giving of your time to make this event. You can see photos from the Multicultural Cup here.